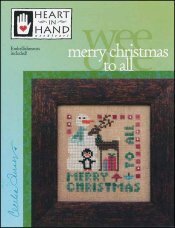 Wee One: Merry Christmas To All [H6371] - $8.50 : Yarn Tree, Your wholesale source for cross stitch supplies. Cross stitch pattern from Heart In Hand. A Holiday design featuring a snowman, a reindeer, a penguin, wrapped gits, tiny trees, and the verse "Merry Christmas to All". Embellishments included. Stitch count 48w x 52h.